Unmanned systems are ideal for hybrid/political warfare, and UUVs are the newest sharks in the water. In recent days, much has been written about the seizure of a United States unmanned underwater vehicle (UUV) by the Chinese People’s Liberation Army Navy (PLAN) ship ASR-510’s (a Dalang III-class vessel). A popular claim is that the PLAN’s seizure of the U.S. Navy’s buoyancy glider was China’s response to President-elect Donald Trump recent Twitter “cry-bullying.” Trump has disputed the one-China policy, recently accepted a phone call from Taiwanese leader Tsai Ing-wen, and panned China’s military building spree the South China Sea (SCS). Trump’s compendium of tough talk on Twitter has included numerous slams and swipes against China over many months, including China’s activities in its peripheral waters. China opposes the presence of U.S. aircraft and naval vessels in waters it claims as its own. While claiming the right to act as it chooses in its own backyard, the Communist Party of China (CPC) warned it would not tolerate U.S. probing and possibly marauding in the region, and would take any steps necessary to oppose U.S. intrusions. The UUV incident is also in effect an extension of China’s rejection of The Hague’s 2016 Court ruling, which refutes China’s “historic claim” over the SCS, as well as Beijing’s frequent irritation over the United States’ persistent “meddling” in China’s (regional) affairs. China’s actions toward the incoming U.S. president are also in line with its interaction with the United States stretching back over a decade. In 2001, George W. Bush found himself in a similar situation with the Hainan P-3 Orion incident, and, in 2009, President Barack Obama contended with confrontation between five Chinese ships and a U.S. Navy survey vessel. The incident received plenty of coverage from political, legal, diplomatic, and military angles, with a focus on the potential for the Asia-Pacific’s undersea balance. While the UUV’s seizure continues to spur debate, a further point of interest should be raised. It is precisely the absence of any political framework on the use of unmanned systems in the region, which we previously addressed in this forum that in principle could lead to further similar deployments of unmanned systems – deployments that would fit neatly within the framework of political warfare. Unmanned systems are no different, serving a state’s policies as we label, “Little Grey (Un)Men.” Either in unison or in swarms, they are ideal for the sort of hybrid/political warfare we are seeing increasingly put to use with exceptionally positive effect, at least for its employers. Just like their human counterparts, unmanned systems are the gateway to stealthy incursions, akin to “Little Green Men” that were instrumental in Moscow’s annexation of Ukraine’s territory. Devoid of even the slightest hint of nationality – flags and service numbers among other national indicators – “Little Grey (Un)Men” are perfect for semi-covert missions. Semi-covert operations and systems, within the framework of hybrid warfare, serve many purposes, one of which is a demonstration of actively opposing the policies of other states. Devoid of legal identification, these systems can never be fully linked to their host state. UUVs are the newest sharks in the water. They are anything but innocuous. The deployment of many UUVs or unmanned surface vehicles (USVs), in contested maritime waters would be a clear sign of support for a state seeking to defend its (perceived) territory. We have run headlong into the need to consider the implications of UUVs being deployed in large quantities according to the same tactics as the Chinese fishing militia. There should be little doubt that the use of unmanned systems sets a strong political signal. Not only does it unambiguously establish the Washington and its allies’ willingness to counter Beijing’s “Little Blue Men,” it demonstrates the United States’ capacity to maintain its presence and reach into highly contested territory. Moreover, while providing additional intelligence to the United States and its allies, it signals an eagerness not only to challenge China’s posture but also to expand in another direction within the framework of hybrid/political warfare. 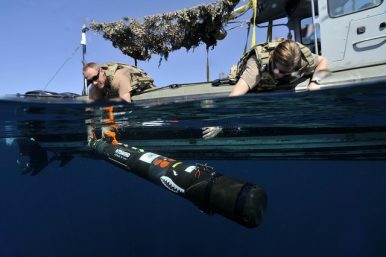 The United States introduced UUVs as one of the newest elements in its force postures years ago and currently occupies the leading role in this realm. Interestingly, Beijing is displaying more restraint in its military drone use than Washington, but we are seeing the same expansion of surveillance and weaponized drone application above, on, and underneath the water. UUV deployment in the SCS, or anywhere for that matter, is part of the landscape of (potential) conventional warfare, and part of the much-generated debate these days about hybrid warfare. Because UUVs are not limited to just one dimension of warfare, they fall within the category of “hybrid.” However, any potential use of force can be classified as hybrid because of its multipurpose character. This in turn immensely expands the basis for risky political engagement. The asymmetric character of America’s “Little Grey (Un)Men” is one of the their most dangerous characteristics, capable of exploiting China’s weaknesses. We ought to bear in mind that nearly every conflict in history has been defined by the application of asymmetries taking advantage of a potential enemy. The result has usually been destructive engagement involving the use of regular and conventional military forces to various extents. Much of the political conflict in the SCS and ECS is comprised of abstract notions, with few images existing. Particularly in the era of digital streaming and video content, an extremely limited degree of video content is available, which makes both conflicts something of an abstract perception within the political discourse of respective national audiences. However, China returning the UUV after seizing it underscores the potential for establishing a framework regarding the application of unmanned systems in East Asia. Tobias Burgers is a Doctoral Student at Otto-Suhr-Institute, Free University Berlin and formerly a Visiting Researcher at CSS, NCCU, Taipei, Taiwan. Scott N. Romaniuk is a Doctoral Student at the School of International Studies, University of Trento and a Research Associate at the Center for the Study of Targeted Killing, University of Massachusetts (Dartmouth), United States.